In most cases, we don’t touch upon the obvious plays. There are other Start/Sit articles (I won’t name names) that will tell you to start Ezekiel Elliot because the Falcons have given up at least 20 fantasy points to a RB in every week this year except one and have given up 30+ games 4 times. No, that is not why you start Zeke. You start Zeke because he is a stud coming off a week in which he rushed for 151 yards and a touchdown. You start him because he’s a stud! This is obvious to anyone that follows football in any form. We don’t list obvious plays so we can look like we are smart when the obvious plays do what obvious plays do. That doesn’t help you. We try to look at some of the plays that are questionable and give you insights on those. 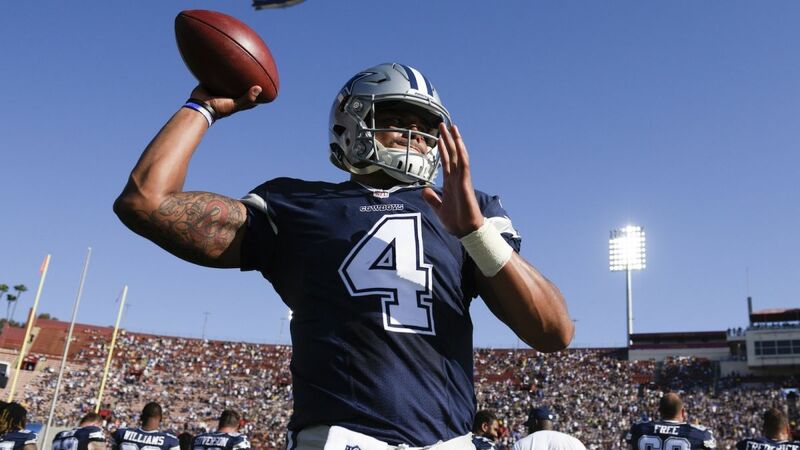 Don’t automatically start Prescott because he is in this column but don’t automatically dismiss him because of the noise in the media that he is not good any more. He might not be having the season we thought he could have and he certainly started the year poorly from a fantasy perspective but he is definitely someone to consider streaming this week. If you have a must-start stud, then play that guy. If you have some borderline plays then take a little longer look at Prescott than you might normally do. Over the last four weeks, he has earned 20+ fantasy points three times (averaging 21.5). He now has a legit weapon at Wide Receiver in Amari Cooper and now he gets to play the Atlanta Falcons. The Falcons are giving up an average of 28.4 fantasy points to Quarterbacks (3rd worst) and have given up 21 passing TDs (2nd most). Each of the last 8 Quarterbacks the Falcons have faced finished as a QB-15 or better that week. They are so bad against QBs that even Alex Smith threw for 300 yards. Still not convinced? Eli Manning threw for 399 yards against the Falcons. Cousins has only one 20-point fantasy performance in the last 5 weeks and that was only 20.7. Would I be shocked if he threw for 300 yards and 3 touchdowns? No, I wouldn’t. He is talented, coming off a bye, and has two of the best receivers in Adam Thielen and Stefon Diggs catching passes. However, he shouldn’t be an automatic start just because we think he should be. Be cautious with him this week against a Bears team that will be playing at home and is very aggressive. The Bears are the 4th-best in passing DVOA and ranked 3rd in fantasy points given up to Quarterbacks. Lindsay seems to be game-flow independent. Regardless of score or situation, he is a player that can earn fantasy points. 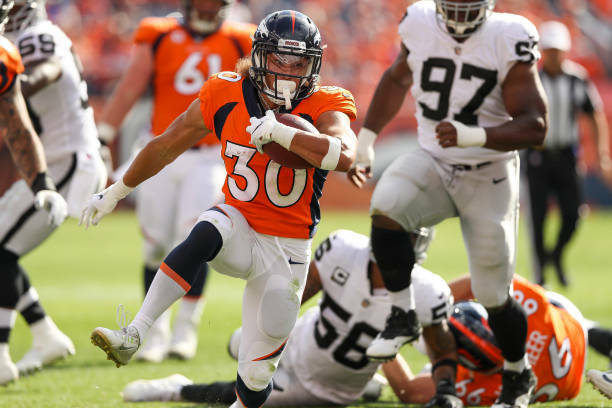 He probably could be utilized even more but the Broncos, for some reason, still insist on getting Devontae Booker some usage. Certainly with Royce Freeman returning from injury, Lindsay isn’t as good as he has been in recent weeks but he can still put some fantasy goodness together against a Chargers defense that has given up more passing yards to the Running Back position than any other team except for the Kansas City Chiefs. The Chargers don’t stink on defense but they are susceptible to the RB position. Lindsay has 6 straight games of double-figure fantasy performances and overall, he has done it 8 out of the 9 games. He has also gained 75 total yards from scrimmage in 7 of his 9 games this season. Howard has been the Bears bell-cow Running Back the last three weeks … and when I say “bell-cow”, I mean he got the most carries on the team. But 47 rush attempts in three weeks of positive game-scripts is not very impressive. Yes, he has scored 3 touchdowns in the last 3 weeks, but he is not producing from a fantasy perspective. Overall this season, he has had double-figure fantasy points in only 5 of his 9 games and has yet to really approach the 20-point mark. Add to that the fact that the Vikings have only allowed 2 rushing touchdowns all year while ranking 6th best in yards per carry. Even in positive game-scripts, he is not producing like we need him to, in a game like this against the Vikings that should be competitive, we can’t expect him to be the main man that propels us to victory this week on our fantasy teams. 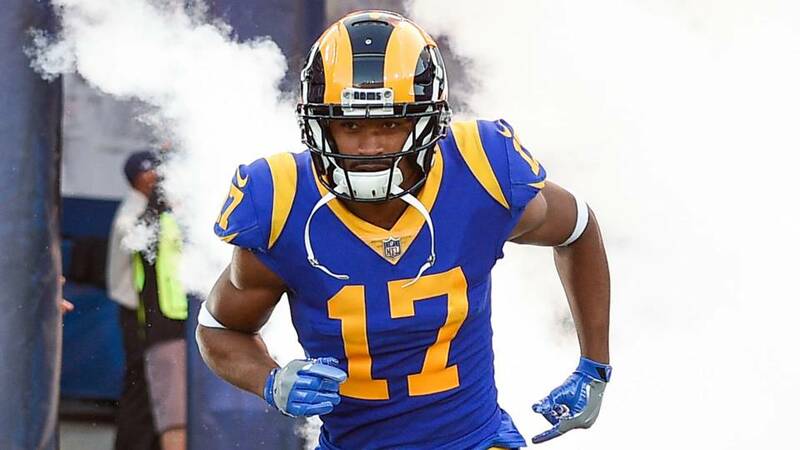 Robert Woods sometimes seems to get lost in the shuffle of the Rams offensive weapons. People also seem to still hold on to the fact that he wasn’t lighting the world on fire when he played for the Buffalo Bills but the guy can play. This can serve as a much-needed reminder that he is actually a Top-10 WR this year. He has a good floor as evidenced by the fact that he has 9 straight games of 12+ fantasy points. This game should be a shootout, which gives Woods a great ceiling, as well. He is able to beat defenders deep and work the middle of the field out of the slot, which makes him dangerous. He has only scored a touchdown in 2 of his 9 games so he is “due” (which is not actually a thing but we still like to say it). With Cooper Kupp lost for the season with an ACL, Woods should be in line for even more usage. I like him so much, I’d try to trade for him if you don’t own him. The Panthers are starting to be a more multi-dimensional offense in the passing game. Even though Funchess might be the #1 receiver, he is not being targeted like one. In the last three games, he hasn’t had more than 4 catches in any of those games, with 44 yards being the most he’s logged. He has also yet to see the end zone in that stretch. In those 3 games, he has only been targeted 13 times which is the same as DJ Moore and only 2 more than Curtis Samuel. In fact, Running Back Christian McCaffrey has had 17 targets and Tight End Greg Olsen has had 16. The Lions should use Darius Slay on Funchess making it less likely that he will see an uptick in targets. Funchess has only scored double-figure fantasy points in 4 of his 9 games and has yet to break the 20-point barrier. He has 9 TDs in 9 games this year. Only Zach Ertz, Travis Kelce, and George Kittle have scored more fantasy points this year. He has two games of 28+ fantasy points. He is a stud. I mean, he must be a stud since he’s doing this despite playing less snaps and being targeted less than the Colts other Tight End Jack Doyle (translation: The Colts like Jack Doyle more). He has to be an absolute stud to be the 4th best Tight End fantasy producer despite having only one game with more than 75 receiving yards. He must be a stud to produce so well despite not catching more than 4 balls in any game this year that Jack Doyle suited up in. He must be a stud though, he only had 5 TDs in the last two years in total. You might be picking up some sarcasm right now because I am laying it on pretty thick. Yes, he has become a must-start but you need to realize that he has been completely touchdown dependent and has been fool’s gold with his results. If you own him, realize that he has been a constant underachiever in the past and that this year he has been on the good side of touchdown variance. If you are results-oriented, then fire him up with confidence because he just keeps scoring touchdowns. If you are process-oriented, then be cautious. 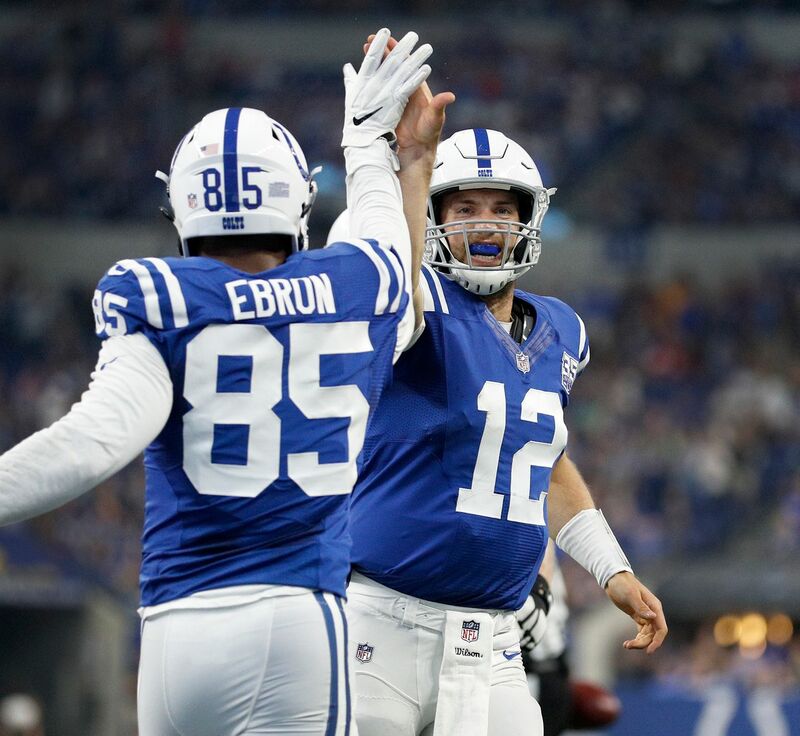 You’ll still start him but you won’t pat yourself on the back when he vultures a touchdown from Jack Doyle, nor will you get upset when TD regression catches up and he catches 2 balls for 28 yards against a Titans team giving up only 6.8 fantasy points per game to TEs and have yet to give up a touchdown to the position. Uzomah has seen just 10 TOTAL targets in the last 3 games. I thought he’d see more of a role last week with A.J. Green out but that didn’t happen. If you take out his 7 target (6 catch) game in Week 6 against the Steelers, he only has 20 targets in 8 games. I will live in the world of “is” instead of “should”. He should see more targets. He should be utilized more, especially in the red zone. But he isn’t. As for the matchup, the Ravens are middle of the pack in terms of fantasy points allowed to TEs but overall, there are one of only 3 teams that have given up fewer than the 2 TDs allowed to Tight Ends this year. Related Items#CPGMFantasyFootball2018 Fantasy Football2018 Fantasy Football Lineup2018 Fantasy Football Start/SitDak PrescottEric EbronFeaturedPhillip LindsayRobert WoodsSitStartStart and SitStart Em Sit EmStart Sit DecisionsStart/SitStart/Sit Fantasy Football Week 11Start/Sit Week 11Week 11 Fantasy Football Lineup DecisionsWeek 11 Start/SitWeek 11 Start/Sit 2018Who should I start in Fantasy Football?Who should I start in Week 11 Fantasy Football?